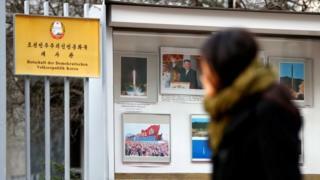 North Korea has been acquiring technology for its nuclear and weapons programmes through its Berlin embassy, Germany's head of intelligence says. Hans-Georg Maassen told NDR TV that many of these activities had been thwarted, but not all were detected. He did not say what type of technology was procured, but said it could be used for civilian and military purposes. North Korea has continued to develop missiles and nuclear weapons in defiance of international sanctions. A UN report on Friday said it had continued to earn nearly $200m (£141m) last year by exporting banned commodities, and implicated several countries including China, Russia and Malaysia. "We have noticed that so many procurement activities have taken place from the embassy," said Mr Maassen, in an interview due to be broadcast on Monday. "From our point of view, they were for the missile programme but also partly for the nuclear programme," he added. "When we see such things, we stop them. But we cannot guarantee that we spot and block each attempt." North Korea has not yet responded to Mr Maassen's comments. A separate investigation by public broadcaster ARD said Germany's intelligence agency first saw signs of North Korea trying to procure technology and equipment in 2016 and 2017. Meanwhile, a UN panel of experts has found evidence that showed North Korea had been helping Syria to develop chemical weapons as well as providing ballistic missiles to Myanmar. 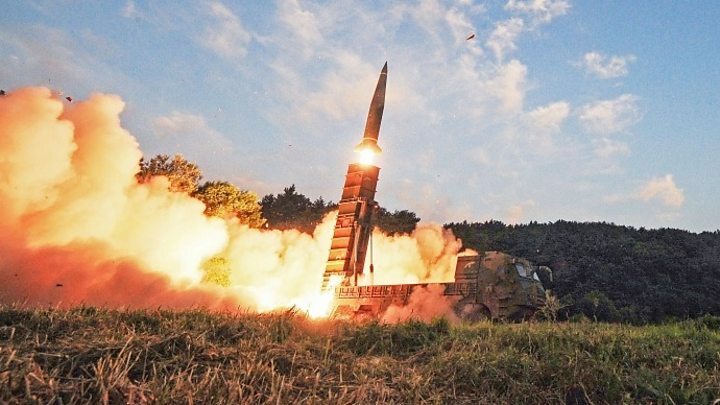 The revelations come amid tensions over North Korea's rapid advances in nuclear and conventional weapons programmes, which have reached their highest point in years. Its latest ballistic missile test, on 28 November, sparked a new series of measures from the UN, targeting petrol shipments and travel for North Koreans. The continued tests have also sparked a war of words between US President Donald Trump and North Korean leader Kim Jong-un. Mr Trump, who has dubbed Kim Jong-un "rocket man", met North Korean defectors in Washington on Friday and said he hoped that "something good" might come out of the Winter Olympics that start in South Korea on Friday. North Korea has agreed to participate in the Games. The North and South have even formed a joint women's ice hockey team, which played its first friendly on Sunday. However, the North is pressing ahead with plans for a large-scale military parade on the eve of the Games.